Durability, safety, and quality are the passwords to the South Gate Engineering Boiler Blowdown Tank. Durability has been achieved through a standard design that incorporates a concentric wear plate and a tangential blowdown inlet. Safety and quality are assured by 35 years of experience in manufacturing A.S.M.E. 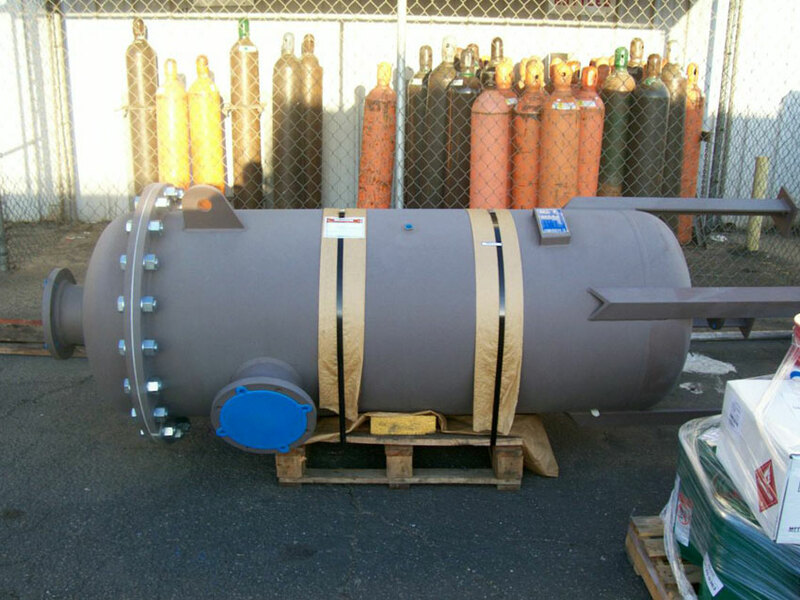 certified pressure vessels. In many areas, Boiler Blowdown tanks are required by law to reduce the temperature and pressure of blowdown from the boiler before it enters the sewer system. These laws should be carefully reviewed before designing the blowdown system. It is generally accepted that the temperature of the water leaving the blowdown equipment shall not exceed 150 degrees F. and 5 psig. 1. The blowdown tank shall be designed in accordance with Section VIII, Division 1 of the A.S.M.E. Code for a working pressure 1/4 the maximum working pressure of the boiler. 2. The shell and head thickness shall be 3/8″ minimum. 3. A pressure gage shall be installed and graduated to read 0 to 25 PSI. 4. A thermometer well shall be located close to the water outlet connection and in contact with the retained water within the tank. 5. The blowdown tank volume shall be equal to twice the volume of water removed from the boiler when the normal water level within the boiler is reduced at least 4″. 6. The blowdown tank outlet shall be controlled such that it remains half full of water after each blowdown cycle. The above criteria are for blowdown tanks connected to boilers operating at less than 399 PSI. For systems operating at higher pressures, or requiring multiple units, please consult the factory for sizing and pricing. 1. The entering blowdown begins a swirling action that increases mixing with the cold water in the lower portion of the tank. 2. The rapid erosion of the shell familiar to a perpendicular inlet is greatly reduced by the tangential entry of the blowdown and the standard wear plate provided on all South Gate Engineering blowdown tanks. Since the blowdown tank is vented to the atmosphere, the incoming condensate, which has been maintained in the liquid state due to the high system pressure, flashes to steam and is partially released into the atmosphere. The remaining high temperature condensate is mixed with cold water in the lower portion of the blowdown tank. Due to the static layering of the water, it is necessary to use a dip tube on the outlet connection of the tank. This arrangement assures that only cold water is discharged into the sewer. In the event the outlet temperature is still excessive, additional cooling units such as heat exchangers or water mixing devices, as shown in the proceeding figures, should be considered.